WHY VISIT BRITTANY AND NORMANDY? Visit Brittany for wild beaches, delicious oysters, thick forests and charming medieval towns. Visit Normandy for all of the above plus tons of history, monuments and memorials. 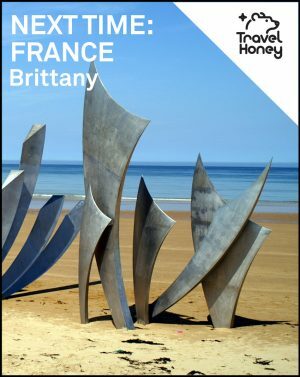 Check out the Travel Honey BRITTANY & NORMANDY PHOTO GALLERY and BRITTANY ITINERARY. WHERE TO STAY IN BRITTANY AND NORMANDY? Le Domaine d’Ablon ($$$$$) Gorgeous countryside cottage-style retreat with on-site bike rentals. Castel Beau Site Hôtel ($$$) Fun and playful beach-front getaway. Just be prepared for a lot of purple decor. La Ferme Saint Simeon ($$$) Perfect spot to relax, with extensive gardens, plush spa and pool. Manoir du Quengo ($$) Manor house built of stone and covered with wild flowers. Quiet with cozy rooms. WHERE TO EAT IN BRITTANY AND NORMANDY? Roscanvec ($$$$) Michelin-stars and outstanding lobster and chocolate dessert. Quite possibly the best meal in Vannes. La Fleur de Sel ($$$) Imaginative dishes and friendly service. Seriously good cheese plate. Creperie Fleur de Seine ($$) Amazing crepes ranging from veggie and ham, to Nutella and banana. WHERE TO GO AT NIGHT IN BRITTANY AND NORMANDY? Brittany and Normandy are not known for nightlife. That said, there are some great places to get a drink (ask your host/place of accommodation) for the best local bets. And there is of course the option to open a good bottle of wine after dinner and enjoy the countryside/coast night air. BEST INSTAGRAM ACCOUNTS FOR BRITTANY AND NORMANDY? HOW TO GET TO BRITTANY AND NORMANDY? By air. If you are arriving from outside of France, it may be best to fly into Paris and take a train from one of the airports. If you prefer to fly directly into the region, there are some smaller airports that have flights from the UK and Ireland. The largest airport in western France is Nantes Atlantique Airport. By train. You can take a high speed train or normal rail service from Paris to many towns and cities within Normandy and Brittany. From there, it’s easiest to rent a car to explore the different rural areas more easily. By bus. The bus is an option to get to the main city, but there is limited bus service to some of the more rural towns. By car. Arriving by car from the UK or Paris is a quick 90 minutes to 2 hour drive, respectively. By ferry. You can hop a very from the UK or Ireland to Normandy and Brittany. HOW TO GET AROUND BRITTANY AND NORMANDY? Having a car to explore the rural countryside and seaside cliffs is the best option! 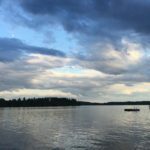 If you are unable to rent a car, there is a railway system that connects all major towns as well as several ferry options. BEST ITINERARIES FOR BRITTANY AND NORMANDY? Check out this Travel Honey itinerary for the inside scoop on the south of France.